Hot dogs, a hot book and a surprise album release (so hot!). 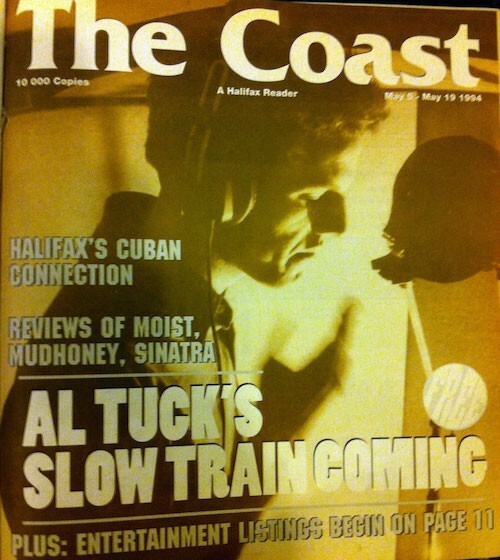 Al Tuck has been Halifax's Bob Dylan since his 1994 debut album/Coast cover. A hot take on hot dogs is slated for the corner of Agricola and Charles Streets thanks to T-DOGS, a New York-style hot dog cart serving up handmade sausages courtesy of Tony Rinaldo, his best bud Patrick Lowe and his brother Sam. Local ingredients, family recipes and chef-inspired creative twists are coming for us in the next couple of weeks. Journalist Miles Howe—himself a sometimes Coast contributor, has released a new book recounting the 2013 blockade between New Brunswick’s provincial government and the Elsipogtog First Nation over natural gas extraction. Howe was embedded within the community during the events, and his book offers a behind-the-scenes account of the protests that drew international attention. Debriefing Elsipogtog is out now from Fenwood Publishing, and there will be a book release event this Thursday at the Central Library. In the meantime, we have a sneak peek up as this week’s Voice of the City. Al Tuck’s a guitar pickin’, ballad singin’ international man of mystery, so a surprise album release tonight at The Carleton is all part of the intrigue. Head down around 8pm to hear live versions from Tuck’s latest, Fair Country. Read more about Tuck here and here. For a little Throwback Tuesday ™ action, here's the legendary Al Tuck in a video for his 1994 debut. New record can be heard here!